He spent his first year of service at the Great Lakes Naval Base, north of Chicago. He traveled home at least twice during the year to visit family. 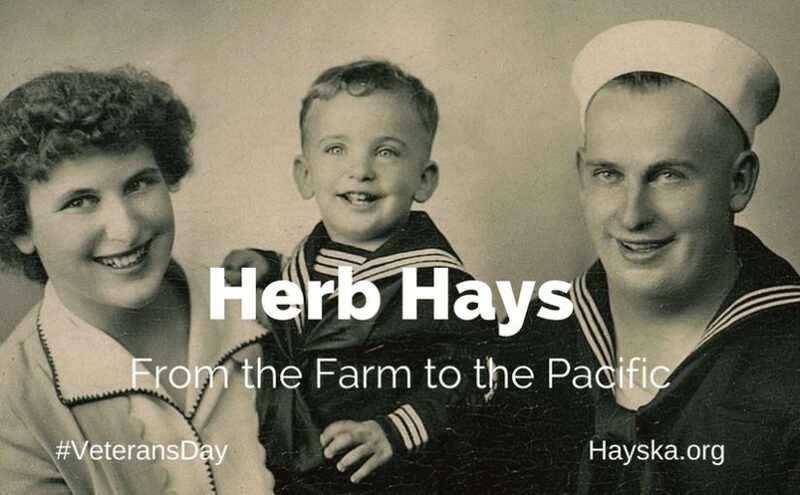 “During World War II, the USS Habersham was assigned to the Asiatic-Pacific Theater.” (7) Herb grew up on the family farm in Polo, Illinois and would travel to the Port of Japan aboard the cargo ship. The only image I found of the USS Habersham was from after it was decommissioned from the Navy. It gives you an idea of the size of the vessel. (1) Avis, Bill, and Herb Hays, Photograph. ca. 1944-1945. Digital image. Privately held by Julie L Bartimus, [address for private use,] Naperville, Illinois. 2017. (2) “U.S., Department of Veterans Affairs BIRLS Death File, 1850-2010,” database, Ancestry.com (http://www.ancestry.com : 7 Nov 2017) Entry for Herbert Hays, enlistment date 9 May 1944, release date 29 Jan 1946. (3) Avis (Trump) Hays, Mt. Morris, Illinois, Interview by Julie (Hays) Bartimus, 28 June 2016; transcript privately held by Julie Bartimus [address privately held,] Naperville, Illinois, 2017. (4) “Dixon Evening Telegraph (Dixon, Illinois),” images, Ancestry.com (http://www.ancestry.com : 7 Nov 2017). 24 June 1944 edition, p3, Polo column. (5) “Dixon Evening Telegraph (Dixon, Illinois),” images, Ancestry.com (http://www.ancestry.com : 7 Nov 2017). 3 August 1944 edition, p8, Polo column. (6) “U.S. World War II Navy Muster Rolls, 1938-1949,” digital images, Ancestry.com (http://www.ancestry.com : 7 Nov 2017). Change report dated 12 May 1945, Entry for Herbert Charles Hays, line 26, rating: F1c(MoMM), Habersham (AK-186). Citing “Muster Rolls of U.S. Navy Ships, Stations, and Other Naval Activities, 01/01/1939 – 01/01/1949”; National Archives, Record Group: 24, Records of the Bureau of Naval Personnel, 1798 – 2007; Series ARC ID: 594996; Series MLR Number: A1 135. (8) “Dictionary of American Naval Fighting Ships – Index,” Naval History and Heritage Command (https://www.history.navy.mil/research/histories/ship-histories/danfs/h/habersham.html : 27 Feb 2012) Entry for Habersham. (9) “U.S. 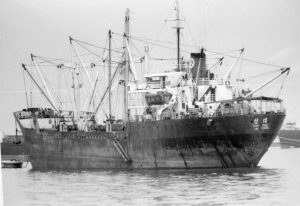 World War II Navy Muster Rolls, 1938-1949,” digital images, Ancestry.com (http://www.ancestry.com : 7 Nov 2017). Change report dated 9 Sep 1945, Entry for Herbert Charles Hays, line 5, rating: MoMM3c(T), Habersham (AK-186). (10) … Change report dated 1 Feb 1946, Entry for Herbert Charles Hays, line 24, rating: MoMM3c(T), Habersham (AK-186).